Can’t Decide Between El Chalten and Torres del Paine? 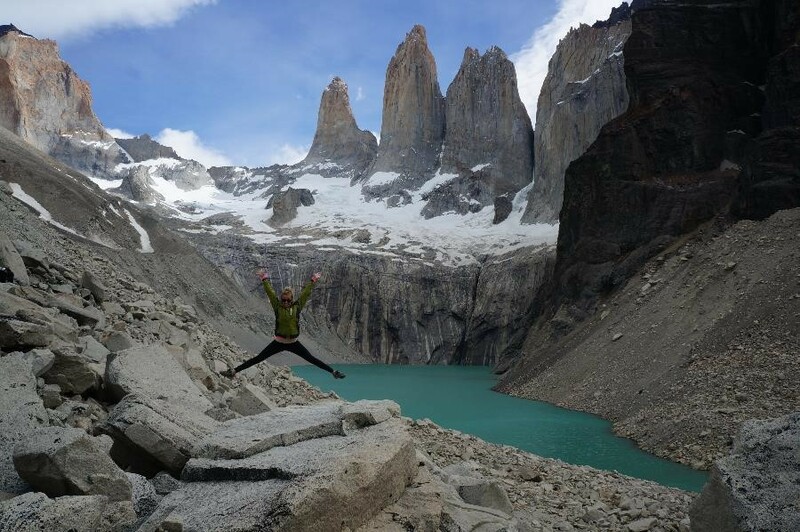 The good news is you can’t go wrong with either El Chalten or Torres del Paine. 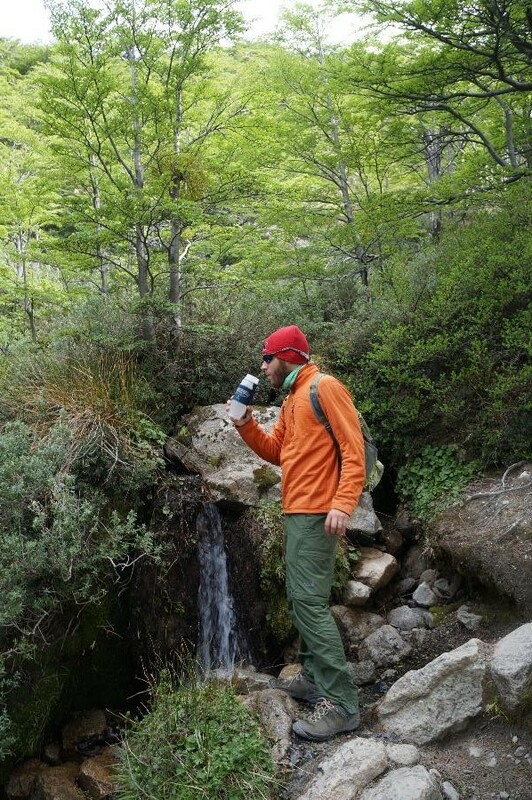 Do you prefer day hikes or multi-day treks? 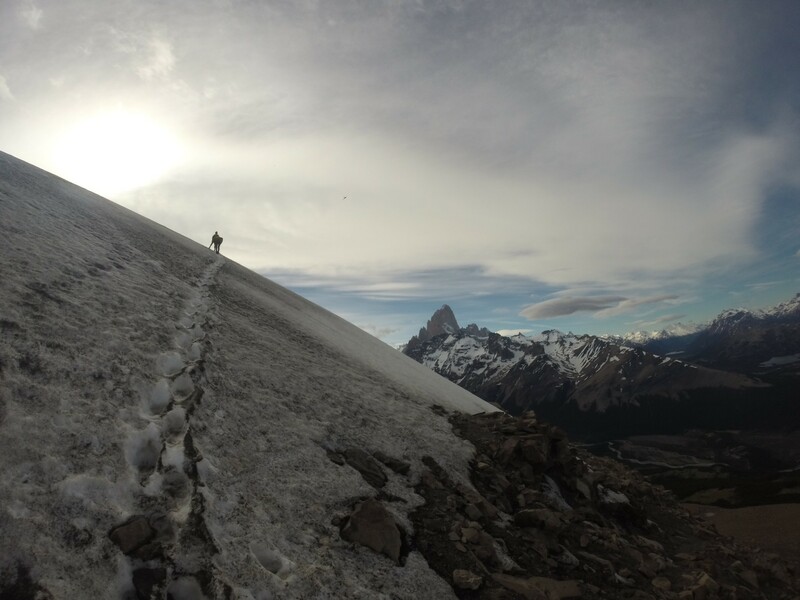 El Chalten is all about day hikes. There are a few designated camp sites but they don’t really add much in the way of seeing more of the park. All the trailheads start right from town, making access extremely easy. 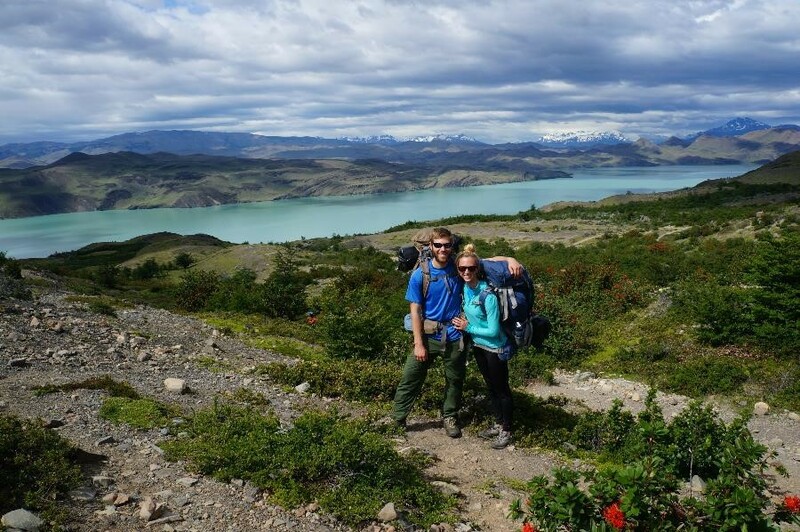 Torres del Paine, on the other hand, requires multi-day treks ranging anywhere from 3-10 days to do it right, depending on if you are doing part of the “W”, the entire “W”, or the full circuit. 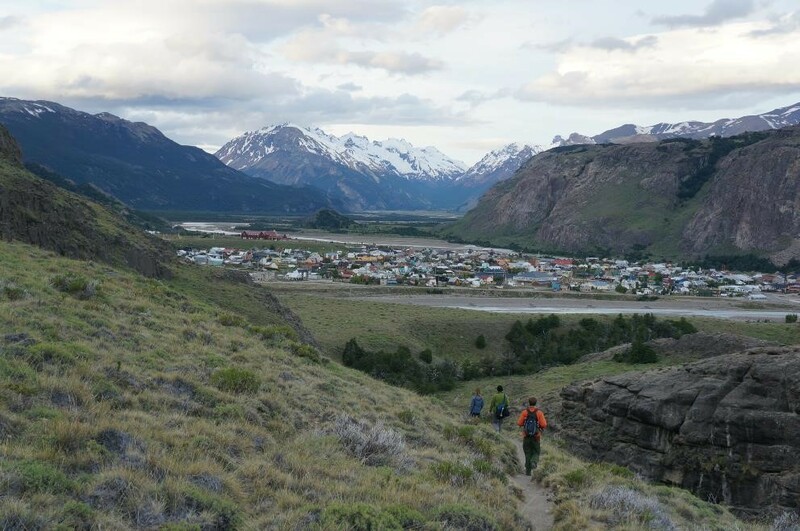 It also takes at least 3 hours to get there from Puerto Natales, the launching point for access to the national park, so day hikes are pretty much out of the question. How much do you like to rough it? And how much stuff do you want to carry? If you want to have a rack of lamb and a glass of malbec before slipping into a nice comfy bed, El Chalten is your best bet. The beauty of El Chalten (besides the scenery, of course) is the ability to go on a world-class day hike and come back to some relative luxury. There is also something to be said for becoming one with the elements, carrying all your gear, and sleeping underneath the stars. In Torres del Paine, you can have all that and more. The best option there is carrying all your food and gear with you (tents, sleeping bags, mattress pads, and stoves are all abundantly available for rent in Puerto Natales). There are some “glamping” options, including a few shelters with dorm beds or tents/ sleeping bags that are already set up for you (so you don’t have to carry them), but these fill up very quickly and are exorbitantly expensive. Carrying all our stuff on the “W” trek. Note that it’s really awkward trying to put your arm around someone with a huge pack on. The good news about carry loads in both places? You don’t need to lug around water because the glacial runoff provides abundant fresh water sources. You can see most parts of the national park in El Chalten with three day hikes. 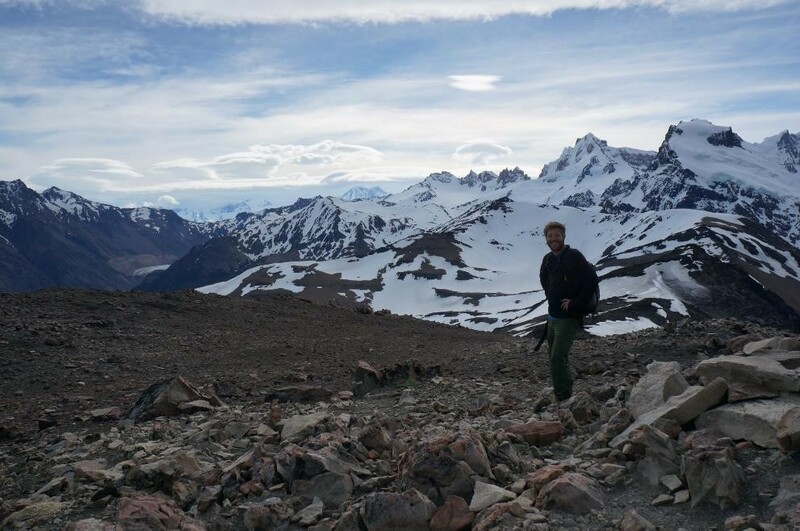 We did the Loma del Pliegue Tumbado, Laguna de los Tres, and Laguna Torre hikes and would rank them in that order. 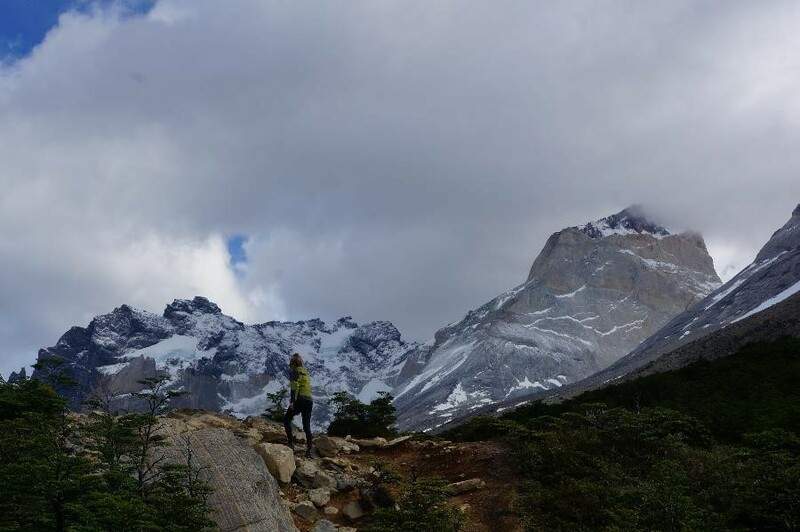 In Torres del Paine, you need 4-5 days for the “W” trek and at least a day of preparation to get all your stuff together. We did not have enough time to do the full 8-9 day circuit there but it sounds incredible and with that much time available should definitely be a consideration. The famous “towers” in Torres del Paine. My wife has a 40 inch vert. French Valley, Torres del Paine. No matter where you go, you have to be prepared for all kinds of weather in Patagonia. What about costs? Is one significantly more expensive than the other? Generally, unless you have your own gear and are planning on spending over a week in Torres del Paine, El Chalten is going to be cheaper. There are no national park or camping fees there and you literally walk from town to all the trailheads. However, food and accommodation in town is a bit on the pricey side relative to the rest of Argentina. Remember to bring hard currency (preferably US dollars) into Argentina to maximize your exchange rate by using blue dollars. Expect $10US for a dorm bed or $30US for a private room. No park fees for this? Yes please. Puerto Natales, the launch point for Torres del Paine, is more expensive, $15-$20 for a dorm and $50 or so for a private room. The bus and park fee just to get into Torres del Paine will run about $50US and the catamaran most people take either starting or finishing the trek is another $30, so you’re looking at $80US per head just to get to the park and back. However, if you spend a week there eating your own food and sleeping in the free camp sites, it averages out pretty well. It’s worth noting that many camp sites in Torres del Paine are paid camp sites, but the free ones are actually better! We would also highly recommend bringing your own food regardless because the few options for ready-made meals in the park are extremely overpriced. The W trek is worth every penny of the park fee. Obviously also look into the reciprocity (“visa”) fees if you plan to cross a border. Argentina charges a $160 fee for US citizens, but Chile recently lifted the $160 reciprocity fee for Americans. Check the fee policies for your country’s citizens for Argentina and Chile before sprinting for the mountains. I really just want to see a glacier up close. Where is the best place to do that? Lucky for you, again you can’t really go wrong. Glacier Grey in Torres del Paine is awesome. 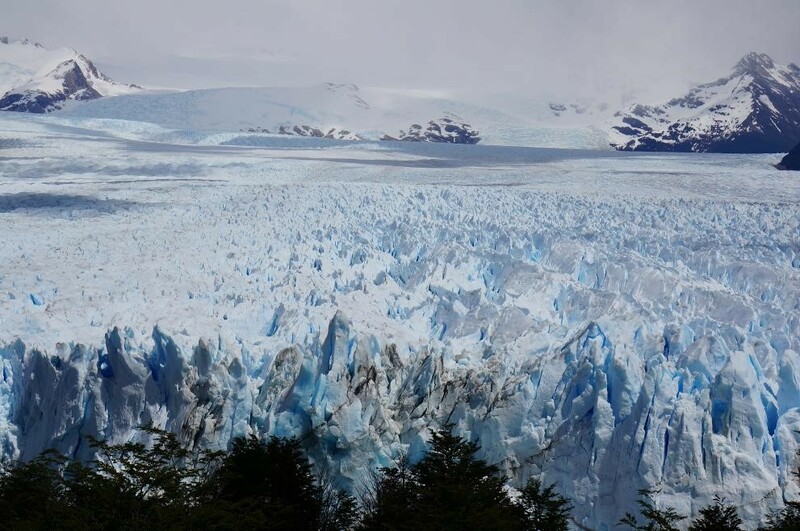 And if you go to El Chalten, you are most likely travelling through Calafate, the launching point for the world famous Perito Moreno Glacier, an absolute must-do (set aside a full day for this experience). So with either option you’re going to see a really cool glacier up close. Both options sound great…I still can’t decide! I would generally say if you have less time (2-3) days, definitely go with El Chalten. You’ll be able to get at least two awesome day hikes in and see most of the park. In Torres del Paine, you need at least 4 days (including one prep day) to do it right, preferably more. If you have more time (4+ days) it just comes down to how much you like to rough it. Do you want to be one with the elements or sleep in a warm bed? Are you okay with putting on a wet jacket and damp boots in the morning? Do you want to carry all your stuff? 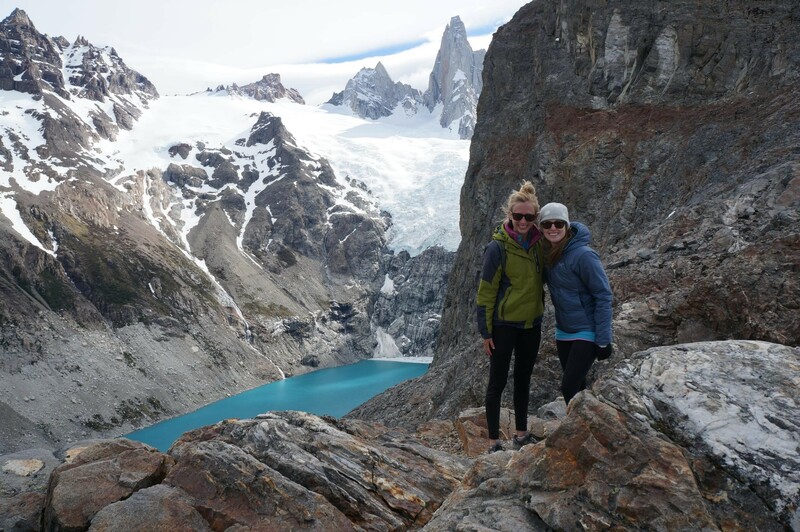 I kind of preferred a steak meal and a bed in Chalten vs. eating watered-down soup and turkey sandwiches in our tent for four days, but I practically had to drag Alison out of the park in Torres del Paine. To each their own. As mentioned several times before, you can’t go wrong here. The scenery and natural beauty in the Andes of southern Patagonia is unrivaled and should be on every traveler’s bucket list. I promise your jaw will drop when you reach the end of these trails, no matter where you are. It’s that spectacular. This is a fantastic post and, having been to both I agree with everything you said! You have some great photos too. We had fog obstructing our view of the Torres, but it was still an amazing hike. Thanks for the kind words! I feel like bad weather every once in a while is part of the experience in Patagonia – we certainly had our fair share. That’s awesome you were able to visit both places as well. Such a beautiful part of the world. We actually did a day hike in Torres del Paine and DO NOT recommend it 🙂 We had no idea what to expect and the W trail was closed due to a big fire, so we took a bus in from our hotel to the park and the Towers hike. We had to RUSH to get back down in time to catch the last bus out… still awesome though. 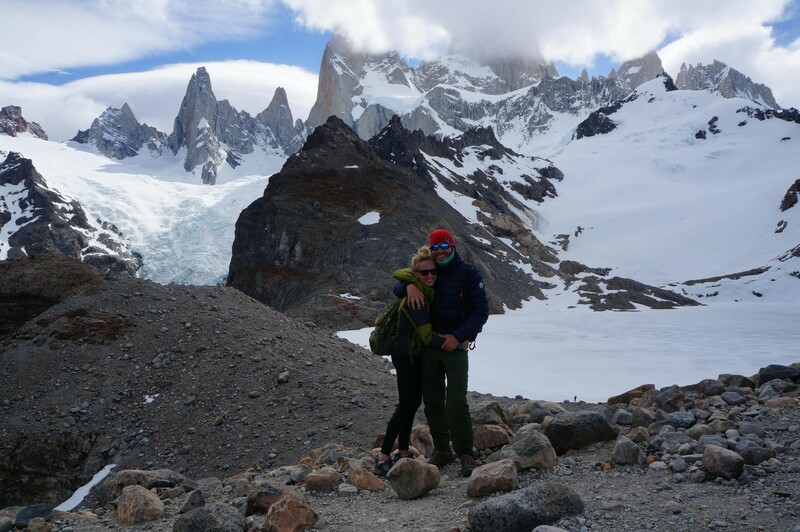 Your the first couple we’ve met who have been to all three places down in Patagonia as us! So cool. 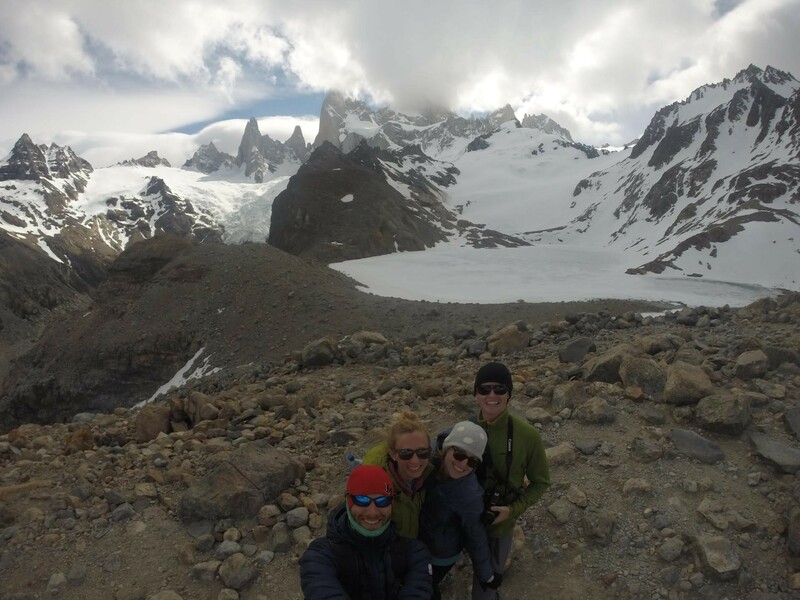 We also did Torres del Paine, Perito Moreno glacier, and el chalten. All were amazing. Awesome! I agree all three places are spectacular. As you can imagine, there are still obvious signs of the fire in Torres del Paine, which is a real shame. But we didn’t feel like the damage took anything away from the W trek. Doing that Towers hike in a day must have been TOUGH, well done! And is it dangerous to do it on my own without someone else? I´m a litte bit worried that I get lost and wander around for days without meeting other people. Also, I dont have much time..so 4 days really is enough to plan it, rent the stuff and do the trail? Isn´t there one you can do in 3 days? Hi Denise! Not a stupid question at all. I believe there are showers at some, but not all, of the Refugios, which are paid camp sites. The free camp sites and some of the paid camp sites do not have showers. The trails are VERY well marked and there are plenty of people on the W trek so it is basically impossible to get lost. Four days, including planning, is not enough time to do the entire W trek. That gives you 3 days in the park – depending on your pace you will probably either be able to do a “U” to see the French Valley and the Towers or Grey Glacier and the French Valley. I would highly recommend going to Erratic Rock in Puerto Natales – they run a free info session at 3pm every day and can help you map out your trip. Best of luck and let us know if you have other questions! Oy. We did the entire circuit of Torres Del Paine a couple of years ago, and I was planning a trip for Fitzroy now but am worried it’s under/less than our desire for an epic backpack trip. It IS in my Classic Hikes of the World book, but only 36 miles total? That isn’t what I fly down to South America for!! Your post has me super conflicted on whether I should try and find an altogether different hike. Hi Margot, that’s awesome you did the full circuit! 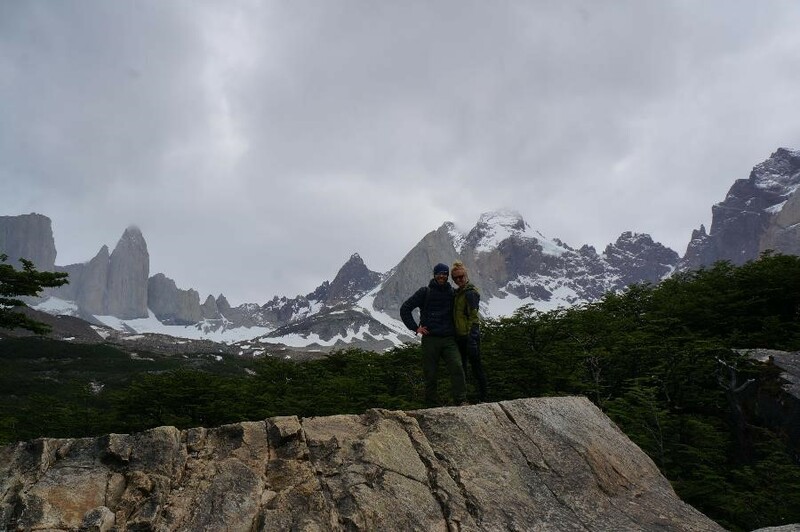 Couple thoughts for you – first, el chalten is amazing, very much rivals that of Torres del Paine and highly recommend. That said, you are not going to get an 8-10 day option there. 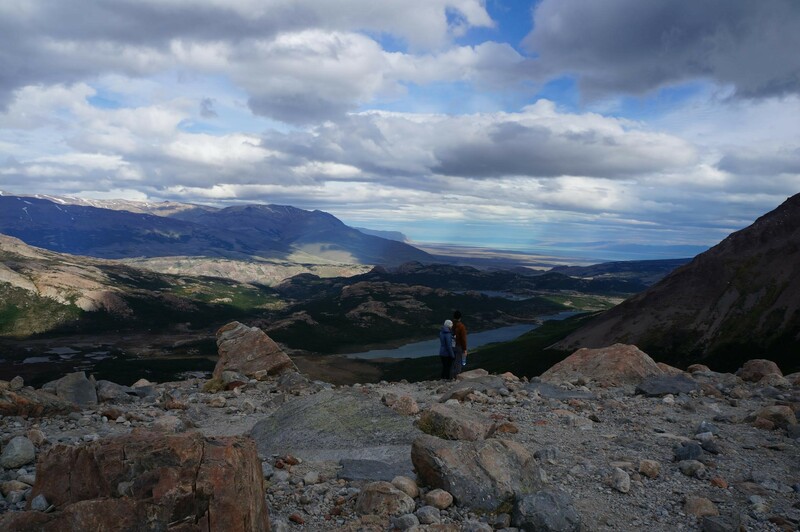 Take a look at the Huemul circuit (think its 4 days) – you could combine that with day hikes for some incredible stuff. Also look north of Chalten in the Lago del Desierto area. If you want another 8+ day trek in South America check out Huayhuash near Huaraz, Peru as well. Best of luck! What a great blog! We are a family of four with two teenage daughters and planning a trip to the Torres. We have checked some of the guided hikes and think they are way too expensive, but are they worth it? Do you think is it necessary? Or hiking on our own is a viable alternative? Thanks and good travels. Don’t overpay for the guided hikes – all trails are well marked, definitely not necessary. Just do your research in advance – there are plenty of resources available in Puerto Natales and within the park as well. Wow great info, im planning to fly to Ushuaia and head north from there and try to hike it all! Im wondering if anyone knows the best place to buy second hand camping equipment, i will need tent, sleeping bag and mattress and possibly camp stove. I looked here in one store in BA but was super expensive, only need it for 3 weeks, any suggestions? Hi Flynn, I know you can get everything you mentioned on the cheap in Puerto Natales (either rent or buy) and probably Calafate and El Chalten as well. Everything in Ushuaia is pretty expensive and we didn’t see any second hand retail places (all high end stuff). BA has a craigslist so you could try that. Sorry I can’t be of more help. In regards to free campsites on the ‘W’ trek, is there one for all 4 nights? On the official website we’ve only been able to find three free campsites – ‘Campsite Italiano’ and ‘Britanico’ (which looks like a day hike so we wouldnt sleep there) and lastly, ‘Torres’. Do more exist? Also do you know whether you have to book them? Hey Kaitlin, super pumped for you all – will be a blast! There is a free camp site on the Glacier Grey side as well, its called Las Guardas I believe. We didn’t do the full circuit but i believe you can do it all with free camp sites so there must be more on the other side of the mtn range, too. You DO NOT need to book the free camp sites in advance, just show up and pick a spot. Also, when you get to Puerto Natales, I’d highly recommend Erratic Rock’s free 3pm info session every day. Enjoy! This was a great post – I wish I would have found it before doing hours of research on TDP, it made the decision easy to do El Chalten this time and do TDP when we have more time. Thanks! Glad it was helpful for you. 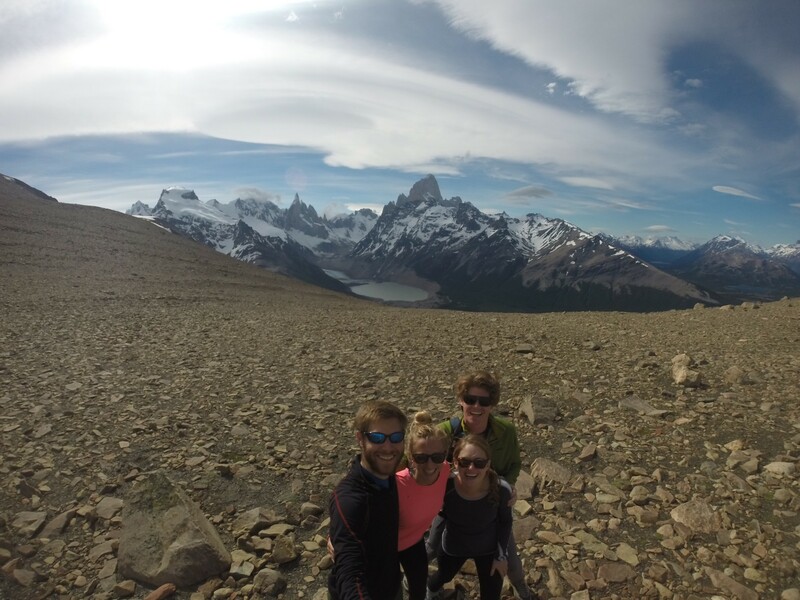 Have an awesome time in el chalten! Hey Brian, awesome post, right at the time for my Patagonia trip. I think that is well planned, Iris – will be busy but not rushed. Enjoy! That sounds like a brilliant itinerary. My wife and I are planning a trip this coming April. How did you enjoy this route? Would you advise us to do as you did? awesome comments, nice pics! What a great trip, you are lucky to have such a wife. Im going to jump into El Chalten based on your rec, thanks. Yes I am Boyd. For some reason she hasn’t left me yet! Enjoy your trip! Hi Kathy! Thanks for stopping by and you are going to have an amazing time in Patagonia. There are plenty of good relatively cheap places to stay in El Chalten. We had a good experience at Hospedaje La Guanaca, but know that the owners do not speak English. Check TripAdvisor and Agoda for some other options. We can also highly recommend Apart Casas feel Centro in Calafate. The owner Sergio doesn’t speak English either but we keep in touch and happy to make an introduction/ arrange for you if you’d like. Definitely need a full day for Perito Moreno so plan on spending the night in Calafate the night before as they start early. All the operators are pretty much the same so I wouldn’t worry much but book in advance if you want to do the Big Ice (the longest glacier hike) as it books up in advance. Let us know how else we can help! This review was so helpful! Thank you for writing it! I was wondering what the ballpark cost of your trip to the Perito Moreno and El Calten was! Wow love your website and lucky that the two of you have such a love for each other and adventure. I found so much valuable info. here prior to starting my own planning for a Patagonia trip. I just returned from a 7 day, 70 mile Salkanty Trek in Peru and it was amazing. I have the itch to hike Patagonia next. I plan to go for two weeks and now that I’m a bit older I prefer the luxury lodge hiking over backpacking. I think I will start in El Calafate for a few days and see the Perito Moreno Glacier, then head to El Chalten for 3 full days to hike what your recommended and then head to TdP – here’s the big question – Do I book an outfitter and do the “W” Ecocamp Patagonia which is a 7 day tour (they carry everything and I stay in the economies) or do I stay in Explora or Awasi (all inclusive ultra luxury resorts) which include private guide and hiking daily. Will I be able to see the main sights French Valley, Towers and Glacier Grey? Appreciate any insight they you can offer. I look forward to hearing from you soon. Sunnie, I would recommend the W trek. Day hiking in TDP will not allow you to get to the best sights. Maybe the Towers are doable in a day but definitely not the French valley or best views of Grey glacier. Salkantay sounds amazing! Enjoy your trip! Fantastic year for you! and a great website! Just found out I have the month of November off…my question is…would you travel to Patagonia or New Zealand? All things equal, I would say Patagonia but you can’t go wrong! Would you recommend flying south from Santiago or from Buenos Aires? Thanks for your helpful blog! Depends where you’re going. If staying on Argentina side, flying tom BA. If TdP, from Santiago. Because of Argentinas nation airline pretty much any time you fly between the countries it will be connecting in BA or Santiago. Awesome post. Thank you for the great info. Do you know if it’s possible to go from El Chalten to El Calafante in the morning and then from El Calanfante to Puerto Natales all in one day? I’m having difficulty finding more information on the bus schedule offered, but it seems like the buses from El Calanfante to PN are only in the mornings? When you were there, did you see any afternoon buses? Not sure Molly, I’m guessing the bus schedules have changed since we were there. My guess is you’d need to hire a private car/taxi to get to calafate early morning and catch the bus to PN. It’s in my bucket list! Wow! This is an amazing place. I can’t imagine how I’d feel when I see it myself. This post was so helpful as I am researching a trip to BA and Patagonia currently. It is quite difficult to know which direction to take when you have a limited time frame, and your information really helped narrow down my options! I hope to visit El Chalten and do some of the local hikes you mentioned. Is this a safe trek to do alone, in your opinion? Or are there any group hikes that you know of that would be worth considering? Hi Liz, glad you found it helpful. Yes all of the treks in chalten are safe to do alone although the ones we did had others on them as well. They are all very well marked. So much good info here! We are currently at the end of our RTW trip and planning our grand finale by hiking in Patagonia. 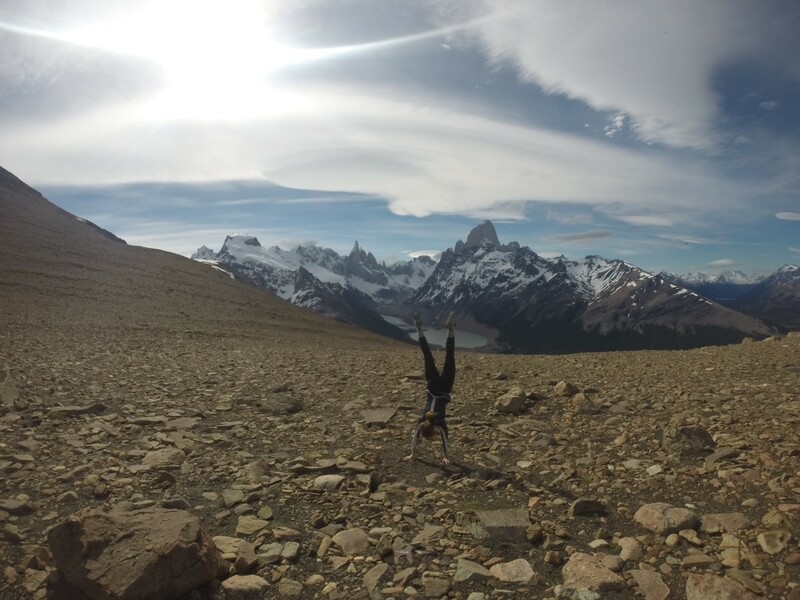 You have convinced us to do both El Chalten and Torres del Paine based on this post. Thanks for all the good info! Wow this is such a helpful post! Thank you so much. I think I have just decided on the ‘El Chaltén’ version. Would you reccommend staying in El Chaltén or is El Calafate also an option for daytrips? And how long should I stay there? Are 3-4 days enough? Definitely el chalten. 3-4 days is perfect. This was so helpful! I only have a week and I thought I wanted to do Torres del Paine, but it sounds like El Calafate might be the better bet. With one week definitely consider the W trek if you like to rough it! Great post! My husband and I are going in December, we definitely want to hit up these to parks. Do you have any other tips? We will be there for three weeks. Allison and Mark- Aussies who don’t get to see much snow!! Hey guys, anywhere in el chalten is close to the trail heads. 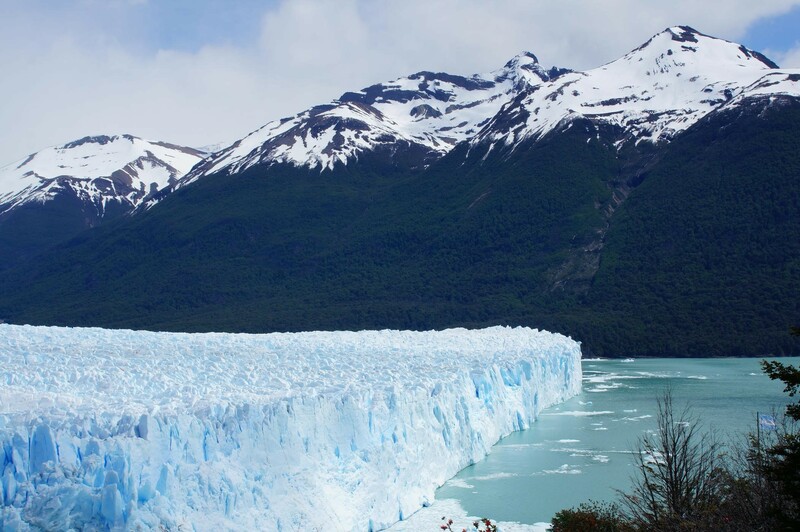 You only need 1 full day in calafate to do perito moreno. Tdp for 5 days is perfect, although not sure if you are allocating a day for prep (which you’ll probably need). Great post Brian. We are arriving in late March with our older teenage boys. This has given us a good blueprint. We were planning on renting a car in Puntas Arenas and driving up over several days through El Calafate and on to El Chalten to do some hiking. Is renting a car a wise decision? Hey guys, to the extent you can do that, having a car will definitely give you more flexibility. You may want to confirm you can take it across the border though. I am so glad I came across this post. My husband and I will be going to Antarctica and we have 5-7 days post cruise to explore somewhere in South America. TdP was initially top of the list, but I want to keep the Antarctic ice theme going and it seems ice trekking on a glacier would be great. The majestic peaks in both locales seem spectacular. You also had me at “enjoying a nice steak and smooth Malbec after a long day hike”. It sounds divine. For those reasons, I am leaning towards El Chalten and Calafate. Our tour operator sent us a tentative itinerary. I heard there is an age limit for the longer glacier ice trek. Do you know the age limit? We are active and 51 years young. We hope we make the age cutoff for the longer ice trek. I appreciate your honesty about the day hikes vs. multi day treks. I am young but too old to carry my gear for three -four days. It seems that is necessary to fully enjoy the W trek in TdP. We received a quote from a luxury EcoCamp in TdP but it only offered day hikes and I think we might miss out. Lastly, are there concerns for weather or crowds in these destinations during the month of February. I appreciate your expertise on this. Hello! Your trip sounds very exciting. I wouldn’t worry about any age cut offs for the glacier trek. As for weather, the weather is always fickle in Patagonia so be prepared for anything. February will be a busier time of year but it’s never that crowded anywhere in southern Patagonia. Enjoy! Hello Brian, I will fly to Calafate for full 4 days, what can I do? Perito Moreno, full day and then i dont know what to choose …el chalten o Torres del Paine? Probably I will have to choose for a day trip, in a car or bus, not hiking, or sleep one night and then come back. Some tips or advices for this 4 days trip? Thank you! Bruno, after perito Moreno in calafate I would just head to el chalten and stay there your other 3 days. It’s a short bus ride from calafate. Awesome post! It reassures me that I can do this myself without paying thousands of dollars in a tour. Just a few questions. I want to cover Torres Del Paine (the W Trek), El Chalten and El Calafate for the Perito Moreno Glacier, Ushuaia and Puerto Natales. Time isn’t an issue but I am trying to work out how many days would be good to spend in Puerto Natales and Ushuaia? Is Ushuaia worth a visit? I’m also unsure how easy it is to get around. I am 21 and a f solo traveler. Is there a suggested route to make it easier – As in are things clearly signposted (bus stops, timetables etc?). I was also trying to figure out if it would be best to fly into Puerto Natales and out of an airport around El Chalten or El Calafate (wherever there’s an airport). I would be flying from and back to Buenos Aires. I am so happy to find your blog about this topic which I am wondering what I should do. 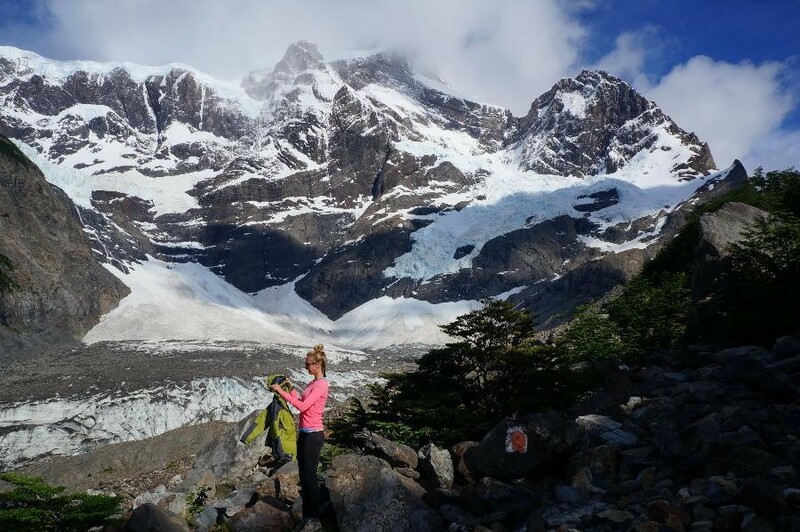 If I am ok with carrying stuff but want to avoid sleep in a tent for Torres Del Paine, do you know how I can plan the stay at the dorm during the W Circuit trek? Also, if I finish the trek, how do I continue with El Chalten? I would appreciate any advices. Thanks! Hi Nadia, you can catch a bus from puerto Natales to el calafate/el chalten. You have to pre book the dorms through the national park. Is there a way to see the highlights without doing the 4-5 day trek? Are there buses running to say, the Three towers, french valley etc? I’m pretty happy to do day hikes but lengthy ones don’t really appeal to me but I DO want to see the good Torres Del paine. Sandy, you could do a day hike to the towers and potentially some of grey glacier as a separate day hike but generally will be more difficult without sleeping inside the park. Hi Brian, me and my wife are planning our honeymoon in Patagonia since we’re mountain lovers. We were guessing your itinerary through Argentina/Chile which seems amazing but we have some missed points. Could you please indicate us the itinerary you followed? Many thanks! By the way, if you plan to visit Barcelona or Spain just ask! (1)Do you think is doable? (2)Would you replace/change some point of the itinerary? We’re thinking to avoid Ushuaia and take a direct flight BA–> El Calafate and save some days to visit Bariloche area instead. Hi Joan! Sounds like an awesome itinerary! Yes I would replace Ushuaia with bariloche. Ok thanks Brian! it’s good to know you fine the itinerary ok, we had some doubts with the order… But can you tell us you’re exactly itinerary, please? Your Patagonia posts have been very helpful for our upcoming holiday in Argentina and your comment about putting your arm around someone with a large backpack on made me literally laugh out loud. Thank you for this very detailed posts, it was very helpful. This is a trip I have been dreaming about for a few years and I want to do it in Feb next year. But I have a few concerns; can anyone do it and what level of health should you be in and will it work for someone that is a semi beginner in trekking? To have an idea, I did Peru in May and couldn’t make it to the highest peak :-(, due to the steep steps. Thanks for posting. This is the exact question I’m debating! I have the time, but my main concern with TdP is that it will be crowded and that will take away from the experience. I’m a solo traveler planning to go at the end of November. When did you go and how did you find the crowds? I’m also wondering if you would recommend hiking west to east or east to west. Thanks for the great post! I am a female solo traveler and will be heading to Argentina in January. I was originally planning on 19-20 days in the Patagonia, but decided to shift some things around to only spend 16 there. A friend of mine recommended spending a weekend in Punta Del Este to get some beach time in. I will be in Buenos Aires studying Spanish for the month prior, so I have some flexibility on when I go to the Falls. I will have everything I need to hike before flying into TDP so I won’t need to spend a day preparing before hand. However, if you think this schedule will be too rushed, I could go to Iguazu earlier in trip and possibly skip punta del este, which would give me several more days in the Patagonia. Hi Brian, I’m so happy I found this post! I’m currently making a plan for our 2 week trip to Argentina, and since the country is huge and we want to see everything it’s so difficult to decide where to go! We have four full days in Patagonia (plus arrival day and departure day), and I was wondering if I could include all Perito Moreno Glacier, 1 day/1 night trip to Torres del Paine and 1 day/1 night trip to El Chalten? Or would it just be better to do the glacier and spend the rest doing day hikes in El Chalten? We are not into long hikes, but more to photography, walking around and seeing the beautiful scenery. What I was feeling curious about in Torres del Paine are the animals and wildlife, would there be a chance to see this in El Chalten? 10 days , we are fying from Santiago to see the Marble caves then to Torres del Paine. Can we also from TdP go to El Calafate? How do we go about doing all these in 10days? Any suggestion? I just traveled to both places (doing the W in TDP, and then 10 days in El Chalten, including the Huemul Circuit). Your blog is great! You explain things very well. For serious hikers, I think El Chalten is hands down the best option simply because of the Huemul Circuit (ridiculously beautiful, not crowded at all, amazing range of scenery). Hello. I’m going to Argentina in the middle of November. Spending 6 full days in Buenos Aires. 2 days in Uruguay. Then flying down to El Calfate. I kept debating if to do TDP but your feedback has been fantastic and I’ve decided on doing Only Perito Moerno and El Chalten. It’s going to be much easier. So that will be a total of 3 days. Then off to Bariloche for 3. Mendoza for 2. Iguazu for 2. and Rio De Janeiro with surrounding islands for a week. If there’s anything you think I should add I would love the feedback. My trip is from November 13 – December 11. Thank you and keep up the adventurous life.